The aesthetic finish for monolithic all-ceramic restorations. The aesthetic finish for all-ceramic restorations. Quick and easy finish of pink aesthetics. 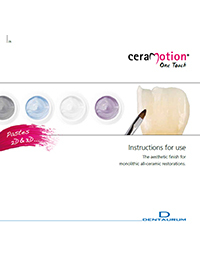 ceraMotion® One Touch are 2D and 3D pastes that have been specially developed for the finish and characterization of all-ceramic monolithic restorations made of lithium disilicate and zirconia. Fast and easy handling thanks to ready-mixed ceramic pastes. Set specially assorted for the easy production of aesthetic, fully anatomical restorations. Maximum aesthetics thanks to color-coordinated pastes with 3D effect. Small changes in shape and the adding of contact points are possible. ✓ No Limits in thickness. ceraMotion® One Touch No Limits is a complementary set of ceraMotion® One Touch and ceraMotion® One Touch Pink. 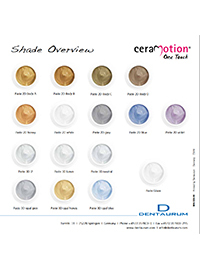 ceraMotion® One Touch No Limits contains ready to use color-coordinated 2D and 3D pastes specially developed to go a step further in the aesthetic of allceramic restorations and recreate in-depth effects of the natural teeth. The new 3D pastes are the first dentins in paste which enlarge the possibility regarding the layering of all-ceramic restorations thanks to the thixotropic effect, the new shades and translucency, retaining the dynamic light. All the ceraMotion® One Touch 3D and 2D pastes liquids and ceraMotion® Stains Universal are fully mixable to create your own range of shades. 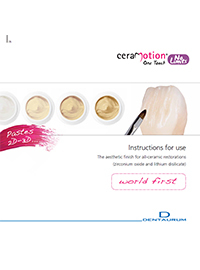 ceraMotion® One Touch Pink are specially developed 3D pastes for the aesthetic finalization and characterization of the gingiva-colored parts of ceramic restorations, made of lithium disilicate and zirconium oxide. ✓ Fast and easy handling thanks to ready-mixed ceramic pastes. ✓ Set specially assorted for the individual design of pink aesthetics. ✓ Maximum aesthetics thanks to color-coordinated pastes with 3D effect. 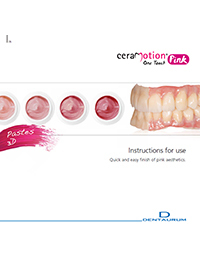 ✓ ceraMotion® One Touch Pink pastes are NOT fluorescent, just like natural gingiva.